There’s a non-profit organization in the Rainey Street District worth getting familiar with this Earth Day. Just across from Chain Drive, one of Austin’s longest running and cherished gay bars, there’s a humble establishment housing a vision to protect and regenerate the tropical rainforests. With preserving the rainforests her task at hand, in 2007, Niyanta Spelman founded Rainforest Partnership. Though she knew she wanted to connect the community of Austin to the communities in and near the rainforests, Spelman admits that when she first began nurturing the idea, she wasn’t sure in which direction she would steer the non-profit. She then realized, “the way you could make the biggest difference is by working at the community level.” Rainforest Partnership has since been admirably dedicated to working directly with the people who call the rainforest home, empowering them to use their once muted voices to take action against deforestation and rallying behind strong economic development. Recognizing the importance of alternatives that generate income for forest communities and taking the uniqueness of each partner’s experience and perspective, Rainforest Partnership has been able to help communities both develop products and market them to generate income that will allow them to protect their forests. Developing environmentally sustainable economies for forest communities not only prevent deforestation, but enables communities to be active and have a voice in situations and projects that directly involve them. For Rainforest Partnership, that’s the mission, and with the help and support of partners in both South America and Austin, the organization can continue the collaborative effort. For Rainforest Partnership, a collaborative environment is important, just as it’s important to “always keep supporters close,” says Spelman. We were pleased to discover the LGBT community of Austin has been one of those close collaborators, contributing heavily to Rainforest Partnership by volunteering time, skills, and offering unrelenting support. While Spelman is impressed and ecstatic with Austin’s LGBT presence, she still doesn’t quite know why the LGBT community has remained so giving throughout the years. Perhaps, we can relate to the forest communities, being faced with adversity, fighting for our voices to be heard and valued, and accepting the challenge to overcome. Spelman calls it a “no-brainer,” that neither community should have to work to be a part of their own community, but even with those frustrations, a connection to the cause is all it takes to make a step in the right direction. With overwhelming support, the LGBT community is an eager contributor and partner in tackling the issue of deforestation, in South America and here in Austin. Stopping deforestation will take more than a few helping hands, and the truth is, it’s not too hard to give a helping hand. Unbeknownst to many, consumer consumption holds some fault in deforestation just as oil companies and government officials do. 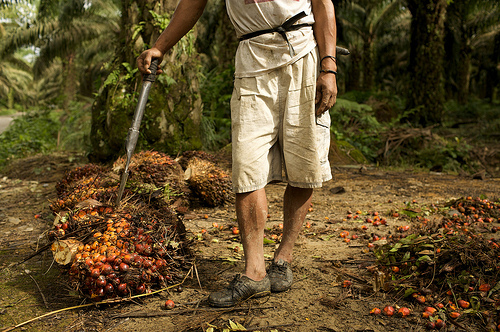 For instance, simply buying products that contain ingredients like palm oil contributes to deforestation. Eliminating some of those products (ice cream, make-up, lotions, toothpaste, and many more) and choosing alternatives can help protect the forests. Indeed, it’s not an overnight process — getting all of Austin on board and eventually the communities surrounding Austin, but Rainforest Partnership vows to start by first educating the public and opening the floor for communities to work together. Informing people of the harms of consumer consumption and making that knowledge easily accessible is next of Rainforest Partnership’s list. Spelman warns that unless we make different choices, we’ll just continue to sit on a branch as we saw it off, and we won’t be able to on this planet, or at least as we know it. However, in the same breath, she expresses that doesn’t focus on it much, otherwise she wouldn’t be able to do what she is doing. And when you ask her Niyanta Spelman what she and the rest of Rainforest Partnership is doing, she’ll tell you, “don’t ask me what I do now, ask me what I want to do.” Long before she’d founded Rainforest Partnership, Spelman wanted to preserve the rainforests. Still, the mission remains the same, to protect and regenerate what Rainforest Partnership calls the lungs of the planet.